Samsung was declared a copycat by a US court and guess what Samsung does comes out with an Ad that compares Samsung Galaxy S3 with iPhone 5 features. Clearly the lack of innovation shown by Apple has given a huge moral booster to Nokia and Samsung. 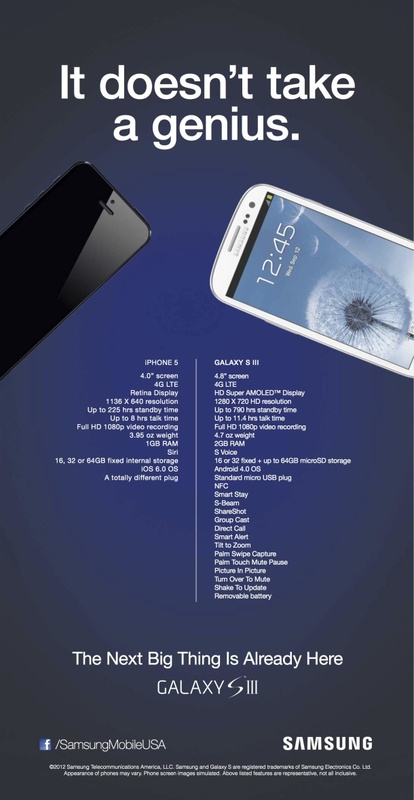 The Ad showcases iPhone 5 as not such a great genius and tries to prove that Galaxy S3 is a much superior phone in terms of innovative features than iPhone 5. iPhone 5 like I sad earlier will sell in millions but the future of the company does not look that promising if they end up simply upgrading the hardware specs even for iPhone 6. As the Ad says "The Next Big Thing is already here GALAXY SIII"